If it rubs you the wrong way, it’s probably rubbing you the right way. Posted on 10/25/2013 by Stand and face the sun. If only we could remove all the noise and just find silence. Is there really such a thing? How far would you actually have to travel to experience this? The great Rishi’s, back in the day, would head to the Himalaya’s to get their meditating groove on. Whether meditating on a mountain, cave, spare bedroom or at the end of your yoga class there is usually still lot’s of noise. We tend to think of noise (citta) as everything outside our head, but there is a lot of noise inside that ball on our shoulders. Yet no one can hear this inside noise accept you. If I’m sitting right next to someone they can’t hear my noise, thank goodness, because most of it is nonsense. A lot of people believe meditation is about emptying their mind and experiencing silence. If that were the case then the first thing you would need to buy to have a good meditation practice is ear plugs, not a cushion for your bum. Next you would need a well insulated room that keeps down the chance of noise getting in. As much as you can’t remove the outside chatter of birds, cars, dishwashers, wind and the breathing of the person you might be sitting next to, you can’t remove the noise in your head, either. It’s not supposed to be about that, because its not possible. I mean don’t get me wrong you can experience periods of quiet and they may even be impressively long, but the mind is eventually going to pick the chatter back up. We can’t create an environment insulated from all the things that disturb our peace, but we can make ourselves less easily disturbed. 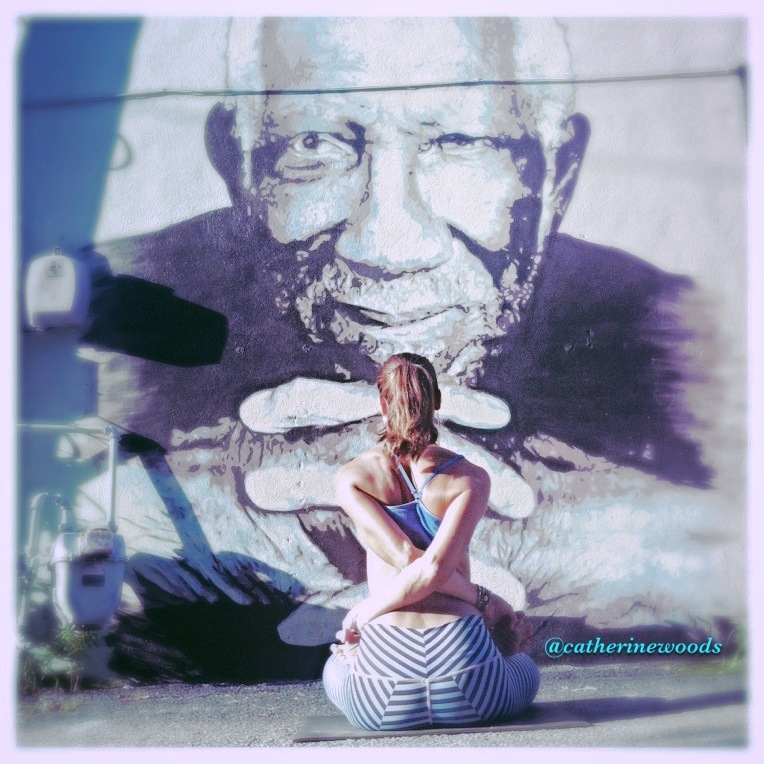 Baddha Padmasana, Mural artist Matthew Foreman and Joanna Jackson. I remember that I never used to encourage students to take breaks while practicing, somewhere along the way, I began implementing this statement. “Take childs pose (balasana) if you need to.” But as of late I have been giving this statement some thought. I have decided in most instances there is no reason to take a break. 9 times out of 10 the reason people drop into child’s pose is agitation/irritation. We bail when uncomfortable, frustrated or up against insecurities. The real truth is we need to be exactly where we are uncomfortable. The only way to get less agitated is to deal with what agitates you. Just like the only way to quiet your mind is to first know what the heck is up there, by listening to it. You can only slow down a wheel that is turning by applying the brakes. What do brakes do? They create friction, they create resistance to the movement. It’s good to rub up against the things that agitate us and really get to a place of using resistance as a tool. The more you expose your self to the agitation the more desensitized you become. Years ago a had a dog that was afraid of other dogs. So at the time I was volunteering at my local animal shelter and I made a recording of the dogs barking in their kennels and played it back to my dog. At first very softly, than I gradually turned up the volume making sure all the while she was adjusting without much distress. I wouldn’t be doing my dog any favors if I tried to have her live in a world where she was never exposed to another barking dog. The resistance you have to listening to what’s in your head and the resistance you are experiencing in your body is necessary. It’s like when a carpenter is making a piece of furniture. He makes certain cuts to the wood but the edges end up a little rough. So what does he need to do? He needs to sand down the rough edges. That’s what you are trying to do in yoga. Sand down your rough edges, the places where things are constantly getting snagged. Take for example the Zamboni machine at a hockey game, it comes in each quarter to smooth the ice back to a more safe and playable service. These physical and mental rough spots we have gather stuff every time we come up against them and don’t work through it. Like plague clogs your arteries, these disturbed rough spot’s clog your mind. These points are your samskaras. You can leave them alone and allow them to gather more resistance, more hold over you, or you can use yoga and your very agitated self to change them. So next time you want your mediation to be perfect, or your yoga practice to be easy remind your self that you are missing the point. You need to get out your tools and become a good carpenter of the mind and body. Or you can think of it this way… you need to hop up on the Zamboni machine of your mind and smooth out the rough spots. Just like when the surface is smooth on a body of water it reflects with perfection all that surrounds it. Just as your mind is doing the same thing, mirroring back to you all that surrounds it. So sit and meditate. Calm the surface of your mind and see the truest reflection of yourself. Our thoughts are like a rock you throw into the smooth body of water, the bigger the rock the more it will disturb the surface. The smaller the rock, well you get the idea. So just as you can rub a rock up against a rough surface to smooth it out and make it smaller. You can rub up against the rough spots and make the things that disturb you have less power over you. Good luck and get to rubbing. Posted on 06/18/2012 by Stand and face the sun. Even if I just took that last line to describe my love of yoga it would suffice, ” I was beginning to learn something about the peace you can find inside an infinite challenge.” Yoga is infinite, there are still poses and breathing techniques my body is still not ready for, nor is my mind for that matter, even after having my practice established as a 6 day a week Ashtanga practice, for the past 12 years. But every word in that farming description fits how I feel about yoga. The author says, “I was fundamentally happier, I found, with my focus on the ground. ” Downward facing dog is just that, connecting to the ground, drawing my attention downward and inward. I have always found yoga to be very primal. For starters, you are barefoot the whole class and you’re mostly on the ground with all four’s, or more. How your body is interacting with the ground determines the success or failure of your yoga practice. Headstand is a great yoga pose that can easily help you understand the line that says ” For the first time, I could clearly see the connection between my actions and their consequences.” And because students are usually forced to slow down and deal with what some of the consequences are in yoga, such as injury, or embarrassment from falling down, they are forced to grow and to feel their body changing to accommodate what they are asking of it. There is also no short cut. A dedicated yogi, one that has stuck with it consistently, knows that the only way you achieve some of the bizarre postures we do, is good old fashioned hard work. The author also says of farming, ” Question: Why is farming like a relationship? Answer: Because you do not reap what you sow. That’s a lie. You reap what you sow, hill, cultivate, fertilize, harvest and store.” In yoga, you reap what you face, repeat, lift, tuck,sweat through, and breathe into. But brute strength can only get you so far. There has to be a degree of finesse and a nice increase of knowledge (vidya) with each practice. Yoga is cumulative in effort. The more effort you put forth the more return on your investment. And what are you investing in anyway? Only the greatest gift you have ever received…your health. I recently saw an infomercial for a Pastor selling a book about taking care of your body with exercise, I think they called it “Bod for God”. It’s premise was, the best way you can thank God, and show your appreciation, and devotion to God is to take care of the beautiful body he/she gave you….DUH! I’ve known this for years. The greatest show of thanks I can give to the divine everyday is treating my body well. Just as a farmer has to treat the earth well. The really good farmer knows what hard work is. A good farmer knows that to produce a crop, a healthy crop, it takes attention to detail. From the grounds composition, to the weather patterns, to the hours of daylight and to the critters/invaders that try and eat his crop, he knows and does it all. A day off means a day that a bug or disease can get a jump on him and destroy his whole crop. Farmers know their land, they know how to see the smallest change in environment and how that might effect his/her outcome. We all need to become more like farmers. We need to pay attention to the details. We need to know our environment and how it’s effecting our mental and physical well being. If we want to live a productive life, as much as a farmer wants to have a productive crop, then we need to tend to matters. It starts with the soil. In the case of the human body, your soil is your mind. It’s where all thoughts begin. It is the point of creation. Your mind needs to be open in order for creative thoughts to flow through. Just like the ground that a farmer wants to plant, it must be loose and fertile, with out rocks, weeds, and bugs. Ground that is compact and dense will suffocate the life right out of any seed. So it starts with the soil, it needs air, nutrients and moisture. Which is why farmers till the soil, over and over until its ready for the seeds. Your mind also needs air and movement, it needs to be fertile for the right things to grow. A yoga practice can do just that. Sutra 1.2 says “Yogas citta vrtti nirodhah”; yoga can make the mind less fickle, that’s my personal translation. Yoga is a moving meditation. The movement, opens things and the meditation part is like the sun, shining light onto things that need to grow. Meditation is simply the process of observation, which will expose the things that would pull you away from a productive and fruitful life. A yoga practice is equivalent to the farmer walking his acres every morning and seeing what has transpired over night, knowing his land and keeping a handle on the things that can get out of hand quickly. Weeds can quickly take hold and suffocate a plant. How many weeds are there growing in your head. A great example of a weed in your mind is a repetitive, negative thought where you are putting yourself down. That will suffocate anything good that’s trying to grow in your mind. Where a narrow mind is like dense soil, the density will not allow anything new to come into your perspective, leaving you stuck in repetitive patterns, that are producing the same results (this is the hala hala, poison). The bugs are like other peoples thoughts and opinions that have come in and tainted your view point, especially if you haven’t formed your own well thought out opinion first. Too much rain will drown the crop, because too much of anything is bad…moderation! Too little light, rain or nutrients is also bad. Just remember this, in yoga it is the terrible two’s that will get you in trouble; too much, too soon, too fast, and too little rest. It’s all about balancing opposing forces (dwandwa, twoness – duality). Be the best farmer of the crop you are trying to produce in your life. I know and believe Old McDonald would have been a great yogi, had he had the time. Who’s to say he wasn’t a yogi, just without the asana’s? Keep this last thought in mind from The Dirty Life ” Of course we have a chance, he’d say, and anyway, it didn’t matter if this venture failed. In his view, we were already a success, because we were doing something hard and it was something that mattered to us. You don’t measure things like that with words like success or failure, he said. Satisfaction comes from trying hard things and then going on to the next hard thing, regardless of the outcome. What mattered was whether or not you thought you were moving in a direction that was right.” Just like sutra 1.12 says “Abhyasa vairagyabhyam tannirodhah.” ; steady practice with non-attachment, steady practice with non-attachment, steady practice with non-attachment, worth repeating because that one is tricky. And one last thing to keep you steering the plough in the right direction is this line from a documentary I recently watched called Enlighten Up,” It doesn’t matter what you are doing, but why you are doing it.” We can so easily forget the why because we are so focused on the what. For me, when I’m on my mat it goes back to what the Author, Kristen said which is “I knew why I was doing, what I was doing, and I BELIEVED IN IT.” Well said. Old McDonald had a yoga practice E – I – E – I Ommmmmmmmm! I believe in yoga, enough said.